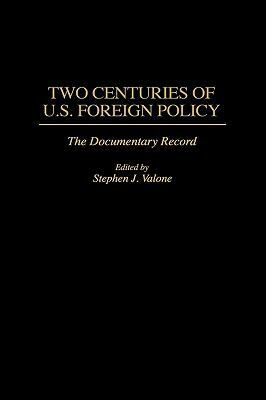 Valone has selected 71 documents that have either defined America's place in the world or reflected a significant episode in the history of U.S. foreign affairs. Each selection is prefaced by brief introductory remarks, that place the document in context, and is followed by a short list of suggested readings for those interested in pursuing the topic further. Designed primarily to supplement a one-semester introductory level course covering U.S. diplomatic history from its origins to the present, this collection can, because of the large number of 20th century documents, also be used in a variety of upper-level undergraduate courses in U.S. history.Valone, Stephen J. is the author of 'Two Centuries of U.s.foreign Policy' with ISBN 9780275953249 and ISBN 0275953246. Loading marketplace prices 97 copies from $71.90 How does the rental process work?